Many people think of retirement centers as sterile buildings filled with small apartments, community rooms, and aging and tired retirees hobbling about with walkers and canes. A retirement community, however, could not be further from this image. 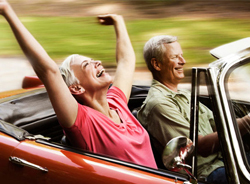 Retirement no longer means giving in to old age or forsaking all the joy and adventure in life; many retirees now find that retirement is one of the most fun filled and free times of their life. And why not? Adults work years to secure a stable and well-funded retirement and should be able to enjoy it! At Vienna Square, we threw out the old image of retirement centers and have instead embraced the wishes and needs of active, fun-loving retirees who seek a sense of adventure and community during their retirement years. 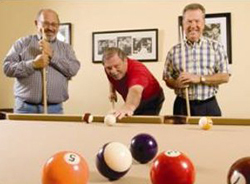 The concept behind a traditional retirement center community room is sound – provide a place for socialization, activity, and fun for residents in the center itself. Unfortunately, this traditional model is built on a picture of retirement that revolves around feeble elderly residents, and not the reality of a vibrant, healthy, and active retiree community. At Vienna Square, Century Residential has created a community built around these ideals of socialization, activity, and good times, but without the restrictions of a traditional center. This isn’t your grandma’s community room! Our 7,000 square foot community room is the star of our community, featuring a ballroom for dance activities, billiards, a fitness center, tennis courts, a state of the art theater, and swimming pool, all for residents’ enjoyment. 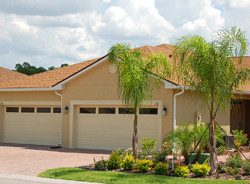 Our pet friendly, welcoming community is laid out in a series of duplex style villas and independent single family homes to meet your retirement housing dreams, all located within picturesque Winter Haven in an ideal Central Florida location. Florida retirement communities abound, but you will find few as conveniently placed a Vienna Square, equidistant from both coasts and two major metropolitan cities with vibrant arts scenes, local nature parks, and some of the most famed attractions in the world. With so much to choose from, Vienna Square makes other retirement communities look dull by comparison! 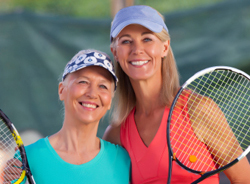 For the active, younger retiree, Vienna Square’s active lifestyle is a perfect choice for fun and new friends. As health situations change, however, you may wish to take advantage of our continuing care programs, providing everything from transportation to meal services for those whose health no longer allows these activities. Even simple, everyday tasks can be challenging with the ailments of age, and our community has programs in place to assist you as you transition through your entire retirement journey. At Vienna Square, you become part of our community and family, something many retirement centers can’t match.